I was 14 years old when Margaret Thatcher became the first woman prime minister of Britain but I was as interested in politics then as I was in doing my homework on time and that was: Not at all. That she was a woman and the first woman to become Prime Minister only boggled my mind in so far as no woman had been Prime Minister before. I grew up believing women (at least in my strong Yorkshire family) were the equal of men at anything, it never occurred to me that others might think differently. 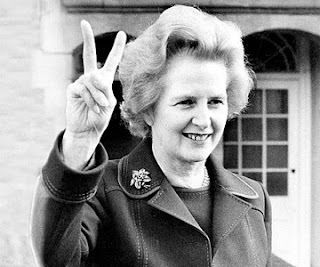 In 1990 when Maggie was ousted from her tenure, the longest of any Prime Minister in the twentieth century, I gleefully celebrated her passing but by then I was 25 years old, working on a local newspaper and politically opinionated and aware, thanks to Maggie. During those eleven and a half years she was in charge of the world, my world changed. I started doing my homework (though that was probably more down to my mum than Maggie Thatcher) and went on to do an English degree. I even got the job I wanted, doing what I wanted and the post graduate qualifications I needed to do it (and that was definitely down to me). Women who protested against nuclear weapons were arrested for trying to make their message heard. A war that even though it was a long, long way away was broadcast live into our homes every night, a very real war with real people and death and horror and fear. There was war at home too with workers pitted against workers in a violent battle of the most stubbornest of wills. They were real people too and were as hurt and as injured as any other in battlefield conditions, the difference being that their entire families were on the battlefield suffering as well. Then there was the Poll Tax, it's attendant riots, Clause 28, bombs, rising unemployment, the privatisation of national industries and all the while the top tenth of the population held onto more than half the wealth. ....And I wore badges of support and protest, marched and sat in. I argued and shouted and protested. It was what you did if you were of a certain age in that uncertain time. Politics were passionate and important. And love her or loathe her, Maggie inspired that passion with a primp of her overly coiffured hair and a tweak of a pussycat bow before dominatrixing her way through a cabinet meeting. When she left Downing Street with a tear in her eye, I jeered and cheered. There might have been a bit of an air-punch and a "What? Really?" YAY!" incident when I was informed, sombrely, of her death by TeenTwin2 (one of whose favourite films is The Iron Lady *rolls eyes*) though I regret my enthusiasm as unseemly, in front of the children, now. Obviously. So I won't be dancing on her grave or having a party or even shouting, for old times sake; "Maggie, Maggie, Maggie. Out. Out. Out" today. And there will be no quaffing of celebratory champagne, mostly because the faces may have changed but the Tory policies remain the same. Having a party at the funeral of a woman effectively politically dead for over 20 years, isn't going to change that. Voting is going to change that.